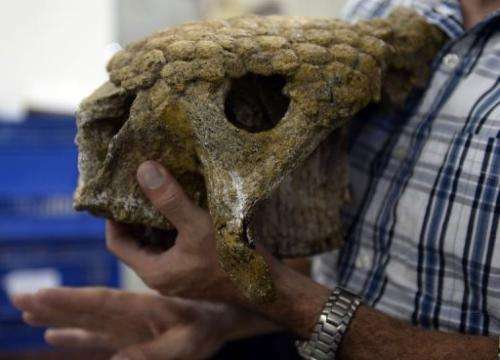 Venezuelan paleontologist Ascanio Rincon shows the skull of a glyptodont found in Venezuela, in Caracas on August, 30, 2013. Under the Venezuelan rich soil lies more than oil: paleontologists have found traces of an armadillo the size of a Volkswagen, a crocodile bigger than a bus, a mastodon of six tonnes and a saber-toothed tiger. Now, they walk after the human fossil. Under the rich Venezuelan soil, paleontologists have found treasures rivaling the bountiful oil: a giant armadillo the size of a Volkswagen, a crocodile bigger than a bus and a saber-toothed tiger. Oil companies' surveys of the soil have uncovered a trove of fossils dating from 14,000 to 370 million years ago. Many of the 12,000 recorded specimens from different eras are now kept in a tiny office of the Venezuelan Institute for Scientific Research. 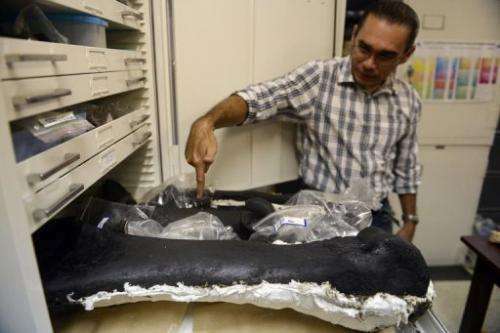 A strong smell of oil fills the room as Ascania Rincon opens the drawer of a filing cabinet to reveal the tar-stained femur of a giant, six-ton mastodon from 25,000 years ago at the end of the Ice Age. Unfazed by the significance of the finds already made, the head of the institute's Laboratory of Paleontology is intent on realizing his next goal: locating human fossils for proof of prehistoric human life in the area. "We are close. You have to keep exploring the area. We have already found spearheads," he told AFP. "What's lacking is reliable indication that man hunted the megafauna that we are finding. And lacking are human fossils." Located in northern South America, Venezuela has a complex geological structure that leaves it swimming in oil deposits teeming with life preserved from so very long ago. 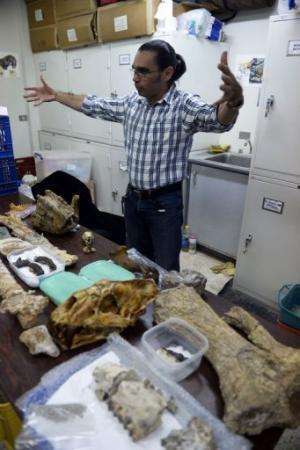 Venezuelan paleontologist Ascanio Rincon shows bones of phehistoric animals found in Venezuela, in Caracas on August, 30, 2013. Under the Venezuelan rich soil lies more than oil: paleontologists have found traces of an armadillo the size of a Volkswagen, a crocodile bigger than a bus, a mastodon of six tonnes and a saber-toothed tiger. Most of the fossils are concentrated in a large area north of the Orinoco River where the Atlantic Ocean originated 200 million years ago, the paleontologist explained. About eight million years ago, the Orinoco was formed, followed by the Isthmus of Panama (or Isthmus of Darien, which links North and South America) about three to five million years ago. The fossils found during the surveys include a featherless chicken that looked like an iguana, a three-meter (10-foot) pelican and giant sloths that lived on land 12 million year ago, unlike their modern relatives living in the trees. But it can take years to prepare a fossil for classification. Experts needed four years after its discovery to identify a saber-toothed tiger, a darling of the collection dubbed Homotherium venezuelensis. Once a fossil is found, experts must remove the sediment, transport it, wash it and carefully compare it to existing specimens. In September, the institute plans to announce the discovery in a remote area of the country of a new species, Rincon said proudly, without revealing the whole surprise. "Imagine a puzzle of 5,000 pieces and you have 200 pieces you are trying to interpret and draw a conclusion that might contribute something to science," he said. Rincon's laboratory, staffed with only five researchers, has state and private support but lacks the logistical and technological resources of similar operations in other countries. 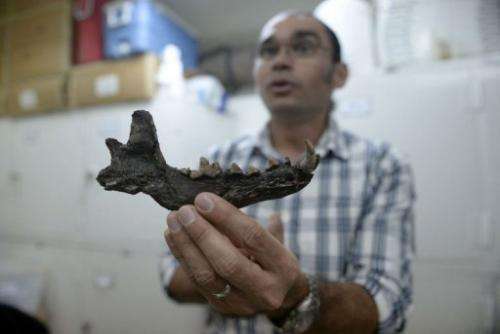 Venezuelan paleontologist Ascanio Rincon shows a jaw of a phehistoric animal found in Venezuela, in Caracas on August, 30, 2013. Under the Venezuelan rich soil lies more than oil: paleontologists have found traces of an armadillo the size of a Volkswagen, a crocodile bigger than a bus, a mastodon of six tonnes and a saber-toothed tiger. His team finds in paleontology a mission to raise awareness of what was on the planet millions of years ago and encourage people to care for the Earth today. "We are destroying what little is left of the forests, oceans, deserts; we are destroying our ecosystems and accelerating extinction," said Rincon. The researcher, who knew he wanted to be a paleontologist since he was eight years old, urged the younger generations to take up the torch. "Paleontology is fun. It seems that it has no use, but it has economic implications. With a fossil record, we can determine the age of an oil field," he said. Where are the pictures of these fossils? They don't have cameras in Venezuela. Pics or it didn't happen. Giant sloths did not live 12 million years ago. Great! We can now feed a family of 4 for a week! Whooooo-hoooooo! Giant armadillo! SwedeFromMinn: While there were many different types of ground sloth, according to the current scientific record, Giant Sloths did indeed live 12 million years ago. In fact, they are believed to have first appeared over 30 million years ago, and did not become completely extinct until around 11,000 years ago. They must've heard you. They've added the photos now. Because they probably didn't have them earlier. stone knife/spear marks in the softer bone while skinning/ butchering will leave evidence that will show up in the fossils. it would be even better if they found points imbedded in the bone... but just because there are spear heads does not mean that they existed together. the title suggests that the finds are from a liquid find, but even with high viscosity liquid or even something like quicksand, a heavier stone tool would settle lower than a bone. LOL -too funny... you aint from the deep south originally, are ya? Take another look at the globe... Hawaii-nei is the furthest south of any state: it's at the same latitude as as Cuba. And you'd need a big imu for one of those puppies. LMFAO! can you imagine the backhoe you would need to dig that out? thanks for the reminder, though, Kiwini... not many people class Hawaii as a "southern" state, although it is technically our southernmost state. that would be on heck of a luau, though !! sorry...you are correct. I meant to put Virginia... don't know why I wrote Ky... probably because I was talking to the wife about heading there (Ky) to visit a friend... thank you for pointing that out. I was not paying attention.